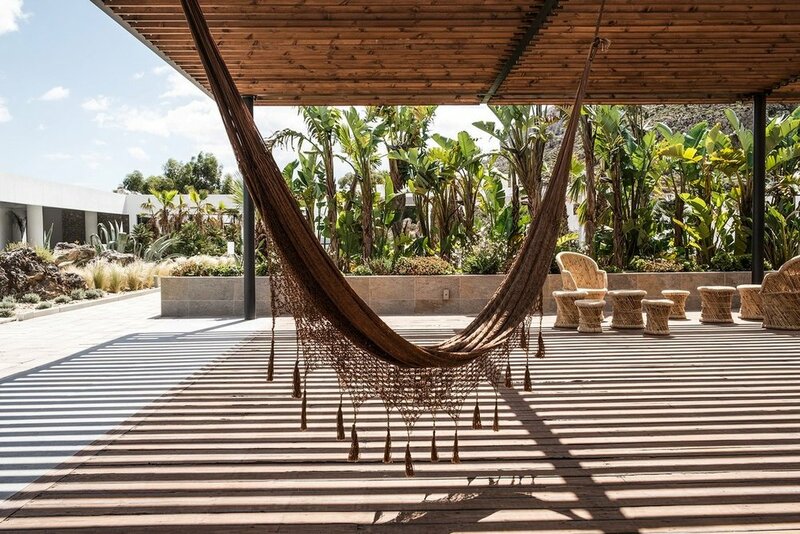 Boho Vibes in Rhodes: Casa Cook Hotel Looks — Nature | City Co.
A weekend getaway full of sand and tan infused desert dwelling boho accents, the Casa Cook Hotel in Rhodes has trip planning front and center for us, as we're dreaming about the perfect getaway! A boutique hotel nestled on the island of Rhodes, this Greek Isle getaway is infused with a stylish boho feeling! Let's start with this lobby. The real question here is "Where do we want to sit?" Seriously: does this setup look insanely inviting or what?! Swivel seating, wicker rattan bucket seats, wood block stools and brown suede sofas; take your pick! A stylish day nook area with burlap woven accent pillows, wicker basket lighting and weathered wood stool. This open space dining area: just look at all of the wood and wicker seating additions throughout! I'll eat my three meals a day here, please! Earthen and stoneware serving bowls as decorative shelving accents! And this tiled wall mural of botanicals and wild birds makes for the perfect contrasting backdrop of nature to go against the look of the row of two-seater sectionals and tables. Can you see the lizard hiding in the brush? Here's another shot of the main dining room. I'm digging especially the concrete T-Style buffet table in center of the dining area! I love how everything stays within the same set of three or four natural colors and elements, exampled in this downward shot of wood table, stone tile floor and tan wicker seating. The real treat for booking a stay is, in my opinion, the suites, as each one has its own unique touch of style, while still maintaining colors from the same palette throughout the hotel: sand, tan, white and black. I do like also how the sectional rug stays within the same family shape as the hanging vanity mirror against the back wall over the writing desk! Another shot of the same space. A simple, yet stylish, wicker inspired desk seating chair. These hanging basket lamps and three legged stools are a treat to look at! Another room that continues on with the same set of colors found throughout the many areas of the hotel. The A Frame ladder style shelving spaces add a nice touch of architectural simplicity to compliment the very organic looks of the many furnishings and decor accents throughout! More outside lounge seating on the way to the pool. Everything so far in presentation looks as if the design concept was meant to encourage the hotel space as a gathering grounds for its guests. And oh my, would you look at that rugged mountain view creeping out from afar in this framed space nook and poolside window setting? Waiter? I'll have another round, and you can just bring me the bill as well! I call first dibs on the hammocks! After all day at the pool, I wouldn't have thought of a better place to nap! The perspective from the hammock, looking back at the hotel, greets you with clean straight lines throughout. I think I've found my staycation space for my next travel destination!